This split solar water heating system has solar collectors on roof and water tanks inside the house, and transfers heat energy collected by the collectors into the tank by natural or forced circulation of the working fluid between collector and the tank. The system comprises of solar collectors, a water tank, a heat exchanger, a controller and pumps. 1. Constant temperature circulation: adopt the auto circulation system to realize constant temperature of the water inside the solar system; Ex-factory default is to ensure the constant temperature of water inside the system and pipelines. 2. Overheat protection: It includes protection of solar collector and electric booster. The former will be operated by the controller automatically to ensure the safety of the solar collector and the solar heat storage system; the later will be controlled by the temperature sensor automatically, to make sure the electric booster work in a safe condition. 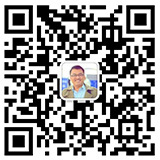 Take manual operation to resume to the working station. 3. Pressure limitation: It functions by automatically sensing the pressure and temperature of the parts, so as to ensure the normal operation of the system. 4. Anti-freezing: It is realized through the circulation of the working fluid to make sure the safety of the operation at the limited temperature. 6. 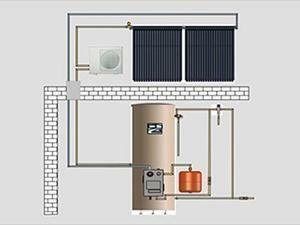 Solar water heating system can be connected with auxiliary heating source at the preset joint. This split solar water heating system is a desirable domestic hot water system. Himin Group supplies global customs with high quality Solar Heating System, Solar Water Heater, Solar Collector, Split Solar Water Heating System, Solar PV Lighting, welcome to choose and purchase.